عندما تزور نابير, ستشعر أنك في بيتك في The Crown Hotel الذي يقدم لك إقامة متميزة و خدمات عظيمة. يقع الفندق على بعد 3. Km من مركز المدينة، ويؤمن الوصول إلى أهم مراكز المدينة. كما يمكن الوصول بسهولة إلى ‪Bluff Hill Lookout‬, Classic Sheepskin Tannery, Napier Prison. يقدم The Crown Hotel خدمات لا غبار عليها وكل أشكال اللياقة وحسن الضيافة اللازمة لإسعاد ضيوفه. يمكن لضيوف الفندق الاستمتاع بالميزات التالية على أرض الفندق: واي فاي مجاني في جميع الغرف, خدمة التنظيف يوميًا, خدمة سيارات الأجرة, مجهز لذوي الإحتياجات الخاصة, مرافق مخصصة لذوي الاحتياجات الخاصة . لقد جهزت هذه الإقامة الفندقية بعناية فائقة لتوفر مستوى عالي من الراحة. في بعض الغرف يجد النزيل تلفزيون بشاشة مسطحة, اتصال لاسلكي بشبكة الإنترنت (مجاني), حوض الاسترخاء, غرف لغير المدخنين, مكيف هواء. يمكنك الاستمتاع بالأجواء المريحة التي تقدمها مركز للياقة البدنية طوال النهار. إن كنت تتطلع إلى إقامة مريحة وهادئة في نابير، فستجد في The Crown Hotel بيتك الثاني. The hotel was lovely, we stayed in the old Heritage section of the hotel one night which had the old world charm including chandelier and working gas log fire. We also spent one night in the new section of the hotel. The room was like brand new, very clean with comfortable King bed. The hotel is well placed for restaurants and the boutique 47 seat theatre showing all the latest movies. It is only a short drive past thePort of Napier to the centre of Art Deco Napier. We just squeezed this in at the end of our trip and couldn't have been happier. The hotel's located in a lovely little area away from the main town, but it still has plenty of character and was just a short jaunt from the centre. The rooms were modern, nicely finished and clean. Excellent value for money. 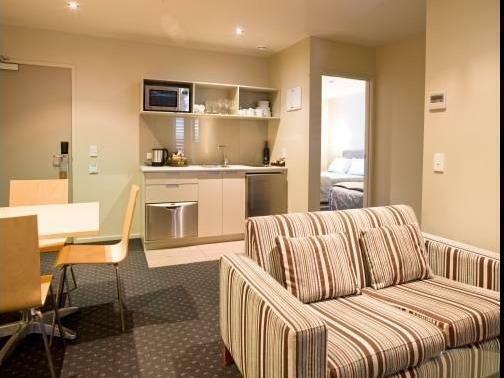 Nice size room, close to restaurants in Ahuriri. Central heating a bit noisy in the night, and no heated towel rail so towels are still damp in the morning. Desk staff insisted on a $200 room deposit, even though room was paid for as we didn't have a credit card on us due to new ones being issued, it was our 3rd visit with no previous problems, we thought it was quite rude. We arrived late but the staff was very helpful and assisted us to book a table for late dinner. The room is very clean and new. We enjoyed our stay very much and we hope to stay for a few more days. I highly recommend this hotel. I stayed for 2 nights recently for work in Napier. The hotel room was lovely with a view out to the waterfront. The room was comfortable and had a great bed and a good choice of pillows. The staff were quite friendly and the internet price was reasonable. Car parking was free. In a great location and would definitely stay there again. Fantastic hotel, very good staff, cleanliness, enough parking area, and amazing sea view. The hotel is not very far from city centre and there are lots of eating places nearby. Spa bath was so welcome after a long day driving. Great view and perfect position. Great stay at the sea, nice staff and awesome accommodation. Milk & Honey Restautant downstairs also highly recommended. 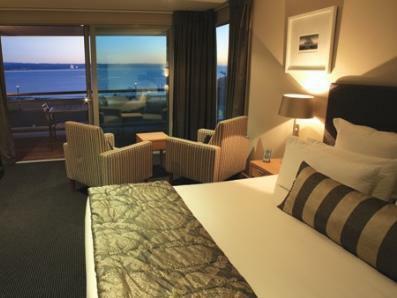 Pros: beautiful room with great view, and comfortable bed, nice deck. Very helpful staff Slight Con: about 20 min walk from downtown Napier. That said, it’s not hard to take a cab downtown, and we loved being across the street from the beach, great view, great walking, and we could hear the waves all night. We found a great breakfast/lunch place ( Miss Browns), and most tours will pick up at The Crown. We would stay here again! We had such a lovely stay at the Crown hotel, staff we very friendly and helpful! 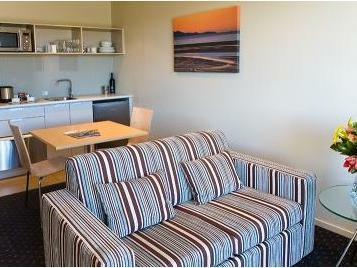 Big spacious apartment style room with a great big lounge and all the facilities including a kitchenette. Although we didn’t need to use it as the room service from the cafe below was amazing, equiped with excellent nz coffee! Great location to a few local shops and restaurants being just across the road and a stones throw from the waterfront. All round great place to stay! We really enjoyed staying this side of town ... the marina which is a ten minute stroll has many bars and eateries which were prob more interesting than in the town itself . The staff were friendly and the place was clean , comfortable well located . My wife and I stayed here over the weekend checking in Saturday and leaving Sunday. 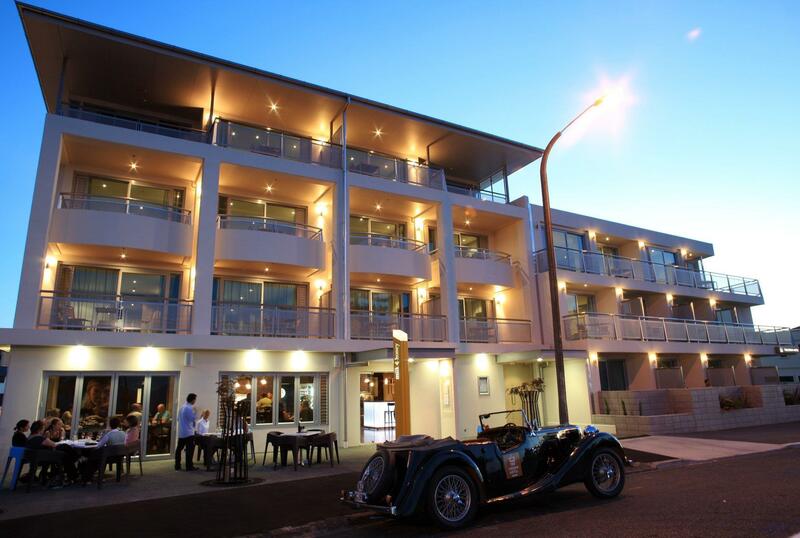 While the hotel is not in the "main" beach area of Napier, it certainly has it own area with a separate vibe which is great. The room was very tidy and had all we needed. Perhaps though a small microwave could be an addition? The hotel has plenty of facilities people might find useful and we would have no hesitation in staying there again. Superb and big room with great views over the bay. 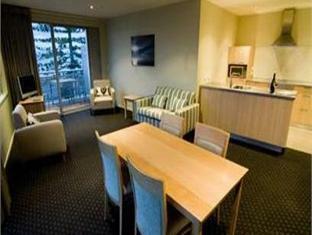 The room is a little pricey and it is some way from Napier centre but it does have shops and restaurants nearby. We were there on a weekend and found the hotel restaurant, which is also a walk in cafe, too busy to accommodate us for breakfast - service needs to be improved so that hotel guests can be catered for ! Comfortable, clean and friendly hotel. Location was perfect for a quiet getaway .... will stay here again when we next visit Napier. Staff were so lovely. We stayed in a one bedroom suite .... really spacious. Absolutely loved this hotel. Great staff, excellent location and very clean spacious rooms. We drove to the various vineyards and the hotel was positioned beautifully in the area. We'd stay here again. This was a hotel I will always remember. I would give it a 5 star rating if the bed was better quality. The bed is the most important part of a comfortable stay. Most Hotels tbat I experience in NZ seem to overlook this detail. A clean, neat and tidy hotel. Views are good. I find the shower lets water leak out on to the bathroom floor, ask for extra bath mats. Not having free wifi is just frustrating, sure you can pay by the day however you check in is one day and check out at 10 is another, 2 days - really? Do note that reception closes at 10pm. If you plan to arrive after 10pm, do give them a call to arrange key collection alternatives. Walkable distance to Everything in Ahuriri, plenty of parking space and only a five minutes to the city of Napier., close to the marina, beach walk and shops.